The recent election will have countless consequences, some of which we can anticipate and others we cannot. 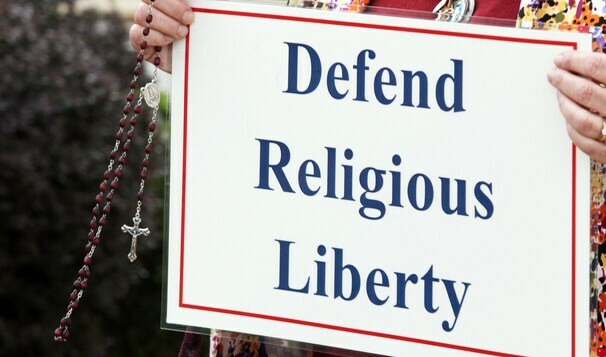 One thing we know for sure is that as Catholics and Christians our religious liberty is most definitely under siege. This administration has made it clear with the passage of the Affordable Care Act and its HHS mandate that it does not intend to afford Catholic institutions the religious freedom they deserve under our Constitution – and notably the religious freedom intended by our founding fathers. Unfortunately, our Supreme Court and most specifically Chief Justice Roberts have given Catholics little hope that the ACA will be overturned in the Supreme Court. Hopefully, as the specific provisions of the ACA come into practice there will be additional challenges to its constitutionality. We can only hope that perhaps it will be struck down as unconstitutional on other grounds. No doubt that in theory Weigel’s proposal makes sense but in practice it might prove to be a difficult move – and one that would certainly garner vicious criticism from our secular media. However, I agree that the Church would be wise to anticipate the legalization of gay marriage and plan accordingly for its specific response and reaction. Perhaps, as with the HHS mandate, Catholic Clergy will be forced into civil disobedience. The New Evangelization means many things, but at its core doesn’t this “movement” call each of us to witness and evangelize the beauty of our faith to the world. How can we do that if our religious liberties are being stripped from us and we are prevented from practicing our faith the way Jesus instructed us. Complacency is NOT an option. The stakes are too high.